Can Collectors Have Their Art And Lend It, Too? American museums owe the vast majority of their collections to gifts from private donors — but getting people to part with their treasures is no small feat. Some collectors want to retain ownership over their art even while exhibiting it in major museums. 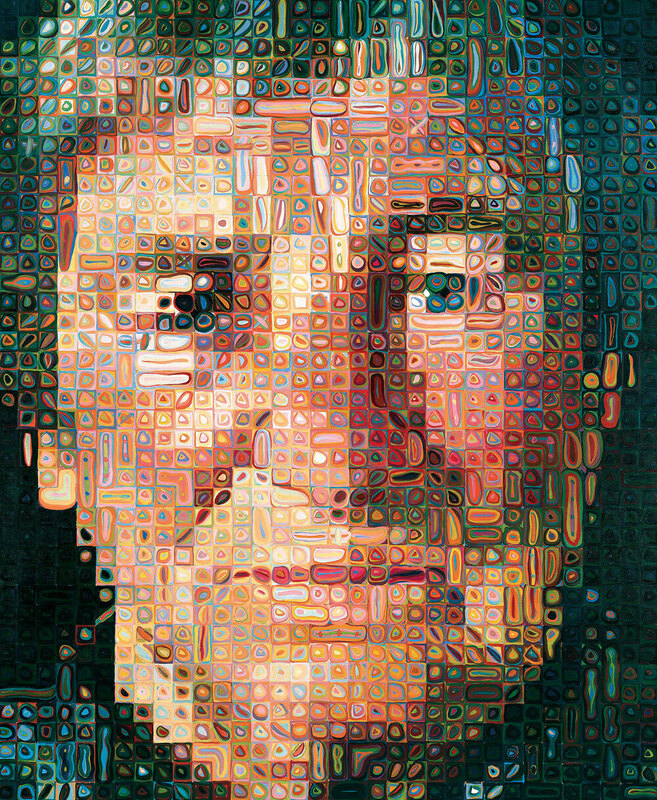 Agnes by Chuck Close is part of the extensive Fisher Collection, which will go on display at the the San Francisco Museum of Modern Art in June. Donald Fisher — founder of the Gap — decided right before his death in 2009 to loan his art collection to the museum, after his plan to build a private museum fell through. Art collectors — whether they are rounding up Renaissance drawings, African masks or big shiny balloon animals by Jeff Koons — often see their collections as a form of self-expression. So when collectors make plans to donate their treasures, they don't take those decisions lightly. American museums owe the vast majority of their art collections to gifts from private collectors. Since the 19th century, collectors such as J.P. Morgan, Solomon Guggenheim, Gertrude Vanderbilt Whitney and generations of Rockefellers have donated their art collections. Today, a big part of a museum director's job is to try to cultivate people who will eventually give the museum their art. But getting a collector to part with his or her art is no small feat. And recently, it seems, would-be art donors have gotten even pickier. "You want to show your own art, so what do you do?" asked late Gap founder and art collector Don Fisher in a 2007 online interview with The San Francisco Chronicle. "You gotta sell it, or you give it away and people leave it in the basement. I don't want our art in the basement." Fisher — who died in September 2009 — wanted to build his own museum, rather than give his collection to the San Francisco Museum of Modern Art (SFMoMA). Fisher proposed building a museum in a national park in the city, but that idea ran into opposition from local activists. So in the summer of 2009 — while he was battling cancer — Fisher dropped the plan and started talking with SFMoMA. Just two days before Fisher died, the museum announced that he and his wife, Doris, had agreed to lend their collection for 25 years. The museum is going to build a new wing, with the Fisher family making a donation toward both the construction and the museum's endowment. SFMoMA director Neal Benezra acknowledges that the arrangement is unusual, since the museum won't own the art outright. But he says curators will get to treat the art almost as though they did. "We will manage it, we will oversee it, we will conserve it, exhibit it, educate the public about it — in just the same way that we do our collection," Benezra says. The feeling in the art world seems to be that SFMoMA made a pretty good deal. But it doesn't always work out that way. Several years ago, billionaire Eli Broad gave the Los Angeles County Museum of Art (LACMA) $56 million to build a new building. As part of the deal, Broad got to choose the architect — Renzo Piano — and the building was named after him. The museum hoped that in the long run, Broad would donate the artwork to fill it. But Broad is now planning to bypass LACMA and build his own museum to show his collection. The new museum will be run by a foundation that Broad had already set up to loan artwork to museums. "We will lend it to any museum, and they can keep it for as long as they want it — as long as they have it on their walls displayed to the public," Broad says. Broad is planning to leave his foundation with a $200 million endowment, almost twice the size of LACMA's. Given the high cost of buying, storing and insuring art these days, Broad thinks that borrowing, rather than owning art, might be the way of the future for museums. "We're going to bear the burden of insurance, we're going to bear the burden of conservation, so we're really relieving museums of those responsibilities and those costs," Broad says. For the Los Angeles County Museum of Art, being stuck with a building named after Broad while the collector plans a competing museum across town has been a little embarrassing. But Max Anderson, director of the Indianapolis Museum of Art, says that LACMA is not alone in making compromises in order to woo a collector who will pay for a new building or a crowd-pleasing show. "When do you draw a line around what you're not doing in order to make room for something that's easier to stage?" Anderson asks. He is concerned about museums "not doing scholarship, not doing controversial exhibitions, not doing exhibitions which aren't guaranteed to have commercial success." In the fall of 2009, the New Museum in New York announced that it was planning a series of exhibitions devoted to private collections starting in February, with the collection of the Greek industrialist Dakis Joannou. The exhibition raises a range of thorny issues. Erik Ledbetter, the director of ethics at the American Association of Museums, says his organization has issued guidelines for what museums should avoid when putting on a show. "Make sure that there's no perceived conflict of interest through the relationship with the lender — for example, the lender being on the museum's board," Ledbetter says. "Don't take any money from sale of the object after the show. And, finally, curatorial control — make sure the museum keeps authority over the content of the exhibition." Lisa Phillips, the museum's director, defends the show. She says that museums simply have to work with private collectors — and she cites the rise of private foundation museums over the past 20 years as impetus. "Many collectors [are] deciding on their own to open their own facilities and do their own programs, which in some cases are really at a similar level of programming as traditional institutions," Phillips says. If that's the case, what's the point of museums having their own collections or their own curatorial staff organizing shows? Maybe in the long run they can just become venues for shows from private collections, organized by curators who are paid by the collectors. One thing that museums are well-equipped to deal with — and private foundations aren't necessarily — is changes in taste. Michael Govan, director of the Los Angeles County Museum of Art, says that some contemporary work will probably end up in the basement, and for good reason. "There is a lot of contemporary art in the world," Govan says. "There is a proliferation of collectors of contemporary art, and there isn't enough space in the museums we have to show all of it. Part of it is that time will take its course and cull those works in each era down to a smaller number that the public and art historians consider valuable for the long term." That winnowing process isn't something most collectors want to think about. They want to see their taste validated. To that end, they're delighted to see their art in a museum — they just want to know when they can pick it up.